and as terrible as a many-bannered army?" By all things blest while endless ages run. Amen. " 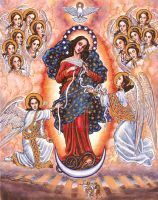 Yesterday was the Feast of Our Lady of the Gate of Dawn (November 16th). 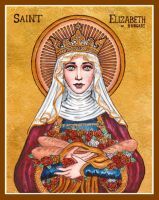 Mary is the patroness of Lithuania under this title. This particular depiction of Mary is also known as Mother of Mercy and Our Lady of Humility. When Saint Faustina was just beginning to establish devotion to the image of Divine Mercy, this was one of the first places where the image was shown, by the Gate of Dawn in Vilnius, near to this icon of Our Lady. I generally like to try and depict the icons in their original state and then add on my own details. 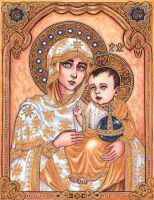 However, in my depiction of this icon (because I am really OCD about symmetry), I had the crown placed just above her head, instead of off to the side. The wings of the angels are the colors of Lithuania's national flag and also of it's capital, Vilnius. Obviously I went with the theme of "Dawn" with the background, because Mary is the Dawn announcing Christ the Eternal Day. I imagine that this is the moment when Mary has just given her FIAT and the Son of God has just become a child in her womb. 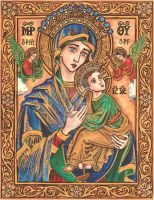 She bows her head in Humility, having just become the Mother of Him Who is Mercy. 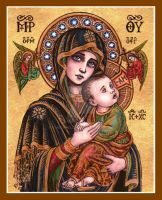 Because she has just become the Mother of the King, the angels are crowning her as the Queen-Mother of the Son of God. 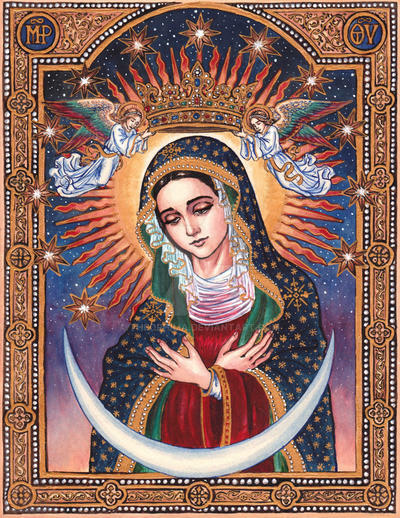 And then while I was doing the gold stars on her blue cloak, I realized that she looks a lot like Our Lady of Guadalupe. Fancy that. “It is believed that the painting was commissioned by the government of Vilnius. It was customary to place paintings or sculptures of various saints in niches of walls hoping that they would protect the building. The governor of Vilnius ordered two paintings, one depicting Lord Jesus the Saviour ("Salvator Mundi"), and the other the Blessed Virgin Mary. Both of them decorated the Gate of Dawn of the Vilnius city wall – a defensive structure with no religious importance at the time. The painting of Lord Jesus decorated exterior of the gate, while Our Lady was placed much in the same place as it is now–a small niche, protected by shutters from rain and snow. Narrow and steep stairs led to a small balcony where the faithful could light candles and pray. 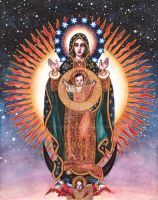 In 1650, Albert Wijuk Kojałowicz published Miscellanea, listing all miraculous paintings of Mary, but did not mention Our Lady of the Gate of the Dawn. 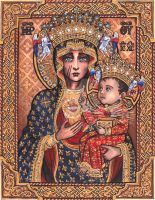 Our Lady of the Gate of Dawn, Virgin-Mother Most Humble, Mother of Mercy and Patroness of Lithuania, pray for us! Your work is lovely. I would like to purchase a print of a couple of your pieces on canvas. How do I do that? This is marvelous! Absolutely love this! You have great skills in making great artwork!! Please keep on going and stay healthy, safe, and strong!! Beautiful work! I can't wait to look through the rest of your gallery! Oh no, not at all! I'm flattered that my little piece helped to inspire you. And I appreciate you crediting me as well! P.S. I love art nouveau too. Alphonse Mucha is a favorite artist of mine. Thanks for letting me use your image in my mood board. Tis much appreciated! Haha I'm not surprised at all you're a fan of Mucha. His gorgeous decorative line work is so inspiring! so beautiful! mary herself would be proud! I love this image! As well as so many others of yours. I didn't see any of them for sale as prints though. Will you ever be making them available for sale? I would love to see these as prayer cards. Etsy would also be a great place to sell your work. THANK YOU!!! 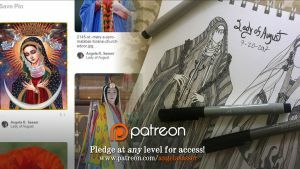 Yes, all of my artwork are for sale as prints. All the information as well as print size and pricing is on my front page in my journal towards the bottom. 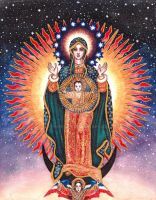 What a magnificent image of Our Lady of the Gate of Dawn! Everything is stunning: the richness of the colors, the gradiation of the sky, the ornate border, the angels' wings. Beautiful work! Painting Love with love... Thank you et que Dieu te bénisse. Thank YOU!! God bless you too! THANK YOU!!! Hahah, I guess I just enjoy details.